I’m just a woman who loves LEGO. I’ve set up this blog so I can write about LEGO and post pictures of my LEGO creations and links to interesting LEGO-related content from around the web. Unless otherwise noted, all images posted are taken by me and feature my own LEGO. Please do not use my images without my permission, but feel free to tweet or link to this blog or any of my posts. See my LEGO photostream on Flickr (I upload my photos to Flickr before posting here at the blog). You’ll get more info and stories behind the LEGO and images here at the blog, but there will be photos in the photostream that don’t make it to the blog. I’m also a food and travel blogger known as The Food Pornographer. I especially like the size of the mug compared to the computer! Hahaha, with the amount of tea I usually drink, I’d like one of those gigantic mugs for real! I notice you like (& own) the mini fig series. 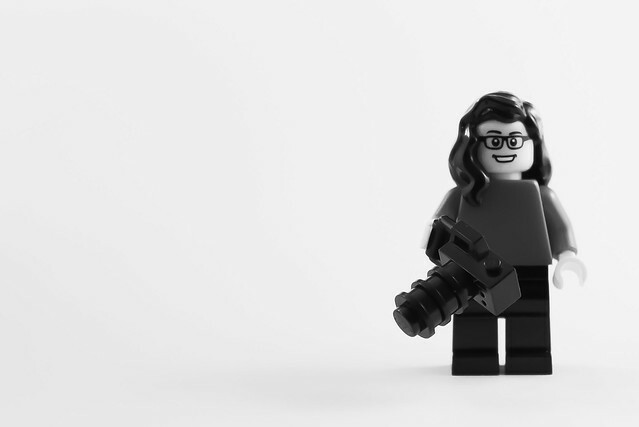 Aside the mini fig avatar you have (which is cleverly built BTW), which mini fig series figurine resembles you? Me, it’s series 5 clown with the pie. I’ll bet your the Kimono girl series 4, correct? No, I’m nothing like the Kimono Girl. I don’t wear dresses/skirts nor makeup! I don’t think any of them resemble me, actually! Well I guess I loss that bet there. OK then which mini fig series collectibles figurine does resembles you? Awesome stuff, I’m trying to hunt down some lego mini figures for my girl & I stumbled upon this, which I must say is good!. Hey, do you instagram too? No, I don’t instagram. I just upload my pictures to Flickr and post them here. Added to my Lego WebComic at http://www.purpleshark.co.uk I hope that’s ok.
No worries! Thanks for the link. would you accept some custom samples for your blog?